How to Add Ringtones to iPhone without iTunes? Fix Here! Ringtones can be a lot of fun, but it’s often a pain to deal with iTunes and all its restrictions. Instead, it’s a good idea to use third-party apps to manage your ringtones. Why iPhone Users Should Consider the Way Without iTunes? Your iPhone can be synced to only one iTunes library at the same time. So you can only add ringtones from one computer. If it is the first time you sync ringtones to your iPhone, it will erase all media files from your iPhone. You need to manually convert the ringtones or other media before transferring. iTunes can be annoying to use and take a long time to load. When it comes to adding ringtones to iPhone, there is a great third-party app - iMyFone TunesMate iPhone Transfer which can break through iTune’s limits. 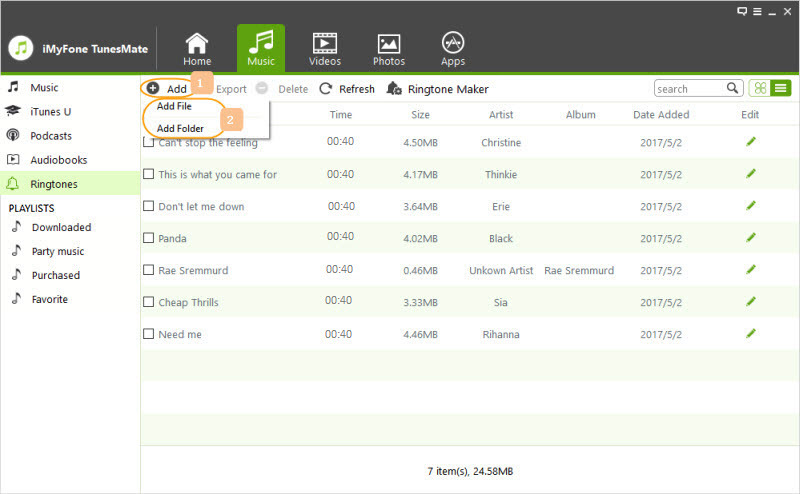 With it, you can transfer both files that you purchased and ones that you downloaded for free. You can send files directly to your iPhone without using iTunes and without losing original media data. Create and add ringtones to your iPhone without iTunes. Syncing computer/iTunes files to iPhone won't overwrite the existing files on iPhone. Add files directly from computer to iPhone instead of going through iTunes library. Support both purchases and non-purchases. Move files from iPhone to computer, iTunes, or any external hard drive. Step 1: Let your computer download and install TunesMate. Connect your iPhone. Step 2: Launch TunesMate and click the “Music” tab. Then go to "Ringtones" category. Step 3: Click “Add > Add File” and locate your ringtones on computer. Click “Open,” and now the ringtones should be transferred to your iPhone. you can edit the info on your audio files. Here is how to add those ringtones using iTunes first, in case you wanted to know. It is more complicated. Ringtones are some audio files in m4r format. Remember to convert your audio files to m4r files. Connect your iPhone to computer and launch iTunes on your computer. Locate where your ringtones on computer. Drag and drop them to iTunes window, so as to add them into iTunes library. Click on your iPhone icon on iTunes and click “Tones” from the left sidebar. 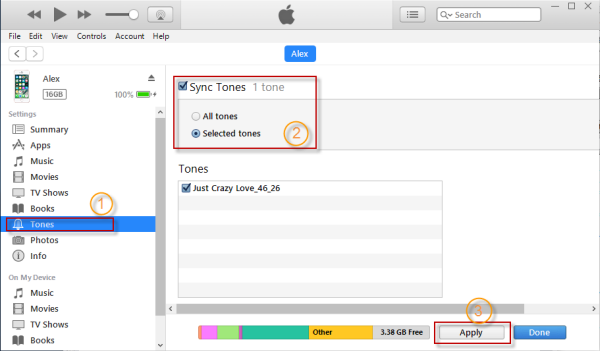 Check “Sync Tones” and choose “All tones” or “Selected tones” to choose added ringtones. Once done, click “Apply” button at the bottom. Note that, the added ringtone cannot be deleted directly from iPhone. 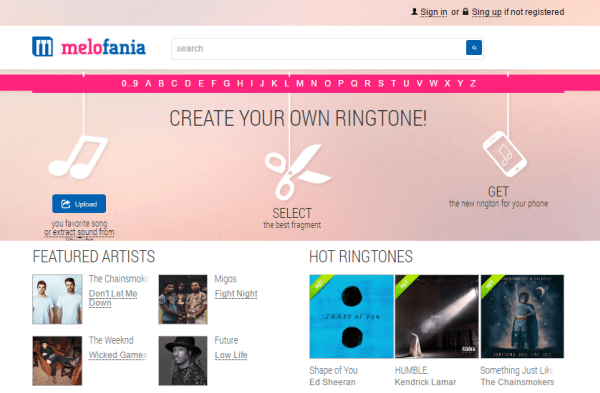 There are some free websites which allows you to download or make your own ringtones. You can get such free ringtones on your computer and use the steps in Part 1 to transfer them to your iDevice. Go to the Melofania website. Go to the search bar and search for the song you want. You can also browse popular songs. Pick “iPhone (m4r)” from the download page so that you can download it in the right format. The ringtone should now be in your computer’s download folder. Use TunesMate the way we described above to transfer the ringtone to your iPhone. 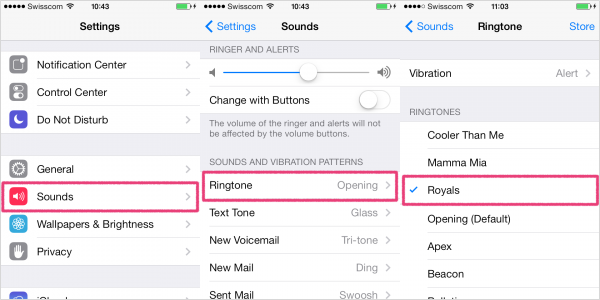 On your iPhone, go to “Settings > Sounds Ringtone”. You can find the added ringtones at the top of the ringtone list. You can change the ringtone there by clicking. On iPhone, open “Phone” app. Tap “Contacts” tab at the bottom. Pick which ringtone you want.